Goalies across the world are taught similar fundamentals of playing goal to fine-tune their game, one of the most important being learning how to find optimal depth in the crease in every situation. Most commonly referred to as the ‘ABCs of Depth,’ goaltenders are taught that there are 4 different zones they can be in when facing a shot: A, B, C, and D. Here’s a break-down of how to hone your depth perception and never find yourself out of position in a game. USA Hockey teaches the ABCs of Depth to goaltenders in their development program, basing the method off of the Buckley Positioning System (BPS), started by current Goalie Coach for the NHL’s Pittsburgh Penguins, Mike Buckley. 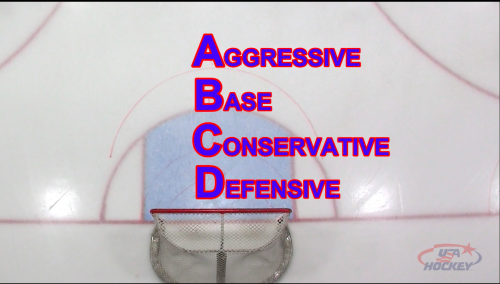 The BPS focuses on helping goalies find optimal depth and positioning in the crease, by breaking it into 4 zones: A, B, C, and D. The meaning of these letters are Aggressive, Base, Conservative, and Defensive. To break-down each zone, let’s start from the crease-out, starting at D, and ending at A. A goalie is in the ‘D’ zone when they are either on their goal line or hugging the post. Defensive depth should be used when tracking pucks behind the net, keeping your feet set in anticipation of movement along the end boards, ready to move wherever the puck may go. A goalie can skate or slide into Defensive depth from other positions in the crease, say when the puck is dumped in along the side boards or cycled behind the net on a penalty kill. Being in the ‘D’ zone allows goalies to track the puck in the hard areas of their end, and to make the first move if the puck is spit out into danger. 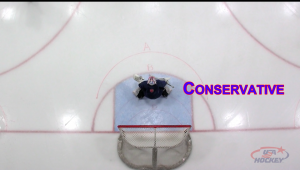 A goalie is in the ‘C’ zone when they are in the middle of the blue paint. Conservative depth should be used when a goalie anticipates a lateral play can be made, say when facing a 2-on-1 rush from the opposing team. Goalies can also be at Conservative depth when recovering for a rebound and getting set for the next shot. Conservative depth is a way for goalies to “play it safe,” decreasing the time it takes and the distance needed to travel across the crease on passing plays, as well as movement in front of the crease. Additionally, goalies should stay in the ‘C’ zone when the puck is at the other end of the ice or near the red line, ready to move to ‘B’ or to ‘A’ when the puck nears their blue line. A goalie is in the ‘B’ zone when they are just outside the blue paint, with the heel of their skate blades on the top of their crease. When facing sustained defensive zone pressure from the opposing team, goalies will spend most of their time at Base depth, since it is a comfortable medium and provides considerable net coverage. Most shot attempts should be faced in the ‘B’ zone, as it allows goalies to cover a good amount of the net while also giving them more time to react to the shot. 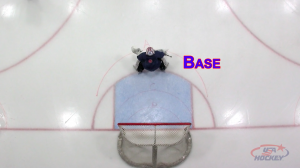 If a goalie’s team is killing a penalty and an opposing forward takes a hard shot from the top of the circles, a goalie is in good position to make the save in the ‘B’ zone. A goalie is in the ‘A’ Zone when they are 2 feet or more outside the top of their crease. Aggressive depth should be used to address a play when it enters a goalie’s defensive zone, such as a quick rush up the ice, a partial break, or a full breakaway. Coming out to challenge gives the shooter less time to think and the goalie the choice of save selection. Goalies can also move to Aggressive depth from the ‘B’ zone and the ‘C’ zone when they anticipate a shot. Quickly moving to the ‘A’ zone just before a shot is taken cuts down on the angle the puck has to the net and gives the goalie more of a chance in stopping it. How do you practice the ABCs of Depth? 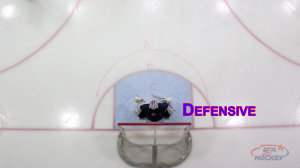 Practicing the ABCs of Depth for goaltender positioning is easy, and can be done either alone, or with the help of a shooter. In practice, repeatedly practice skating and sliding between the 4 zones and get comfortable with the movements, committing them to memory. Envision yourself in a game, and how you would react to the puck being moved in your zone. When practicing with your team or with friends, try concentrating on how you follow the puck as it’s cycled around and moved in and out of your zone. In time, you should be able to utilize each level of depth without even thinking about it. When you get used to it, the ABCs are a great way to hone your positioning skills and will help carry your game further along.